The Ferguson Rifle by Louis L'Amour is available at Amazon, Barnes and Noble, and BooksAMillion. 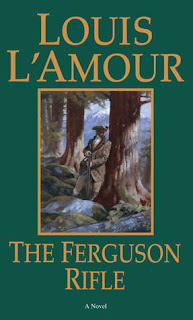 The story didn't feel as put together as other L'Amour stories - there were a few rough patches where the narrative broke/didn't flow seamlessly. And the repetition, sheesh. Ronan Chantry gained the nickname Scholar as he moved west and, every time he was introduced to another character by that nickname, we readers got the story about why he's called Scholar. How many times did I need to hear that story? The same applied to all of the information given in regard to the plot's mysteries - the same information was repeated multiple times without further development of the information. It felt like L'Amour, when writing the rough draft, couldn't remember if he'd already told us the information so he mentioned it every time he thought we needed it and then forgot to go back and weed out excessive/repetitive passages. This one was a rough read for me, the repetition aggravated me more than normal.